No. 19, Jalan Emas SD5/1A, Sri Damansara Industrial Park, 52200 Kuala Lumpur, Malaysia. Giamac Technologies Sdn. Bhd. 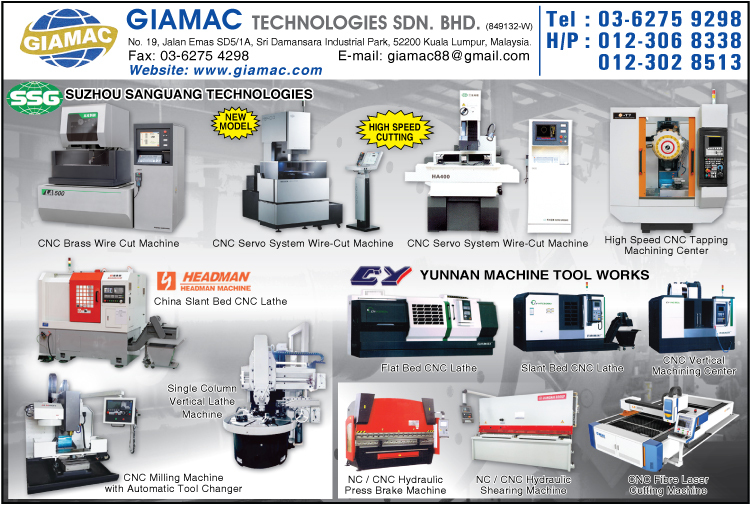 (also known as Giamac) is a company based in Malaysia which is specialize in the total solutions of machinery and equipment, such as conventional machine, NC and CNC machine tools. Today, Giamac has obtained the accreditation from worlds well-known and trusted brand in metal cutting industries as authorised distributor for their machinery and equipment, eg. Shanghai Machine Tools (No. 2). Giamac would like to express appreciation to all customers and suppliers. Without your trust, Giamac will not be successfully expanding the network over Malaysia in a short period. As return to the customers, Giamac is committed to providing the best marketing, services and technical support with a strong and reliable technical support team. In the future, Giamac will establish more professional technical support team to assist the customer within 24 hours upon receiving your enquiry! Should you face any technical matter or have any enquiry, please feel free to contact Giamac anytime.